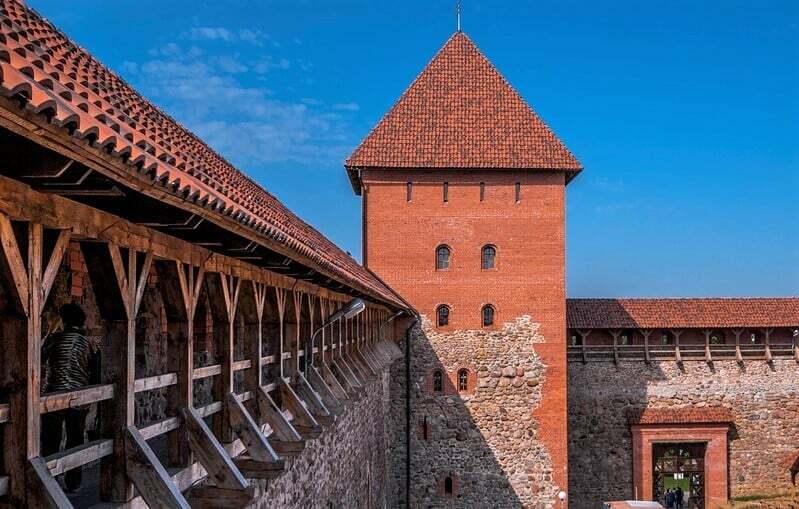 Castles of Belarus are living symbols of the country’s history, important attractions of Belarus, which are definitely worth visiting for a tourist. Dozens of castles have been built all over the country, but only a few of them have survived to this day. 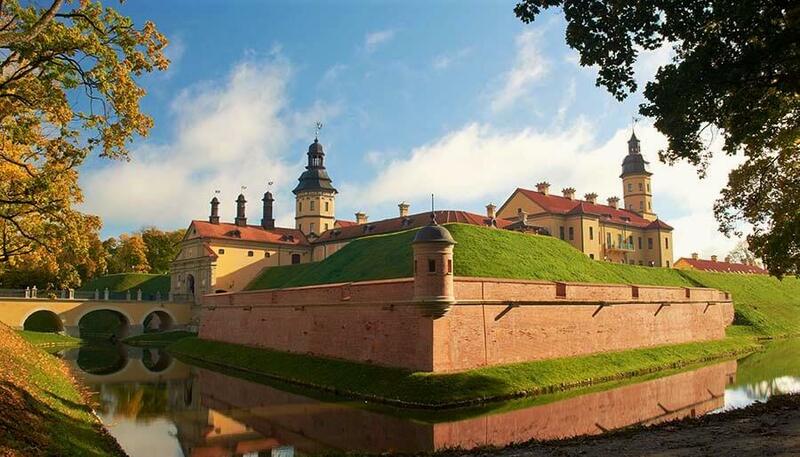 The most famous castles of Belarus are in Mir and Nesvizh. 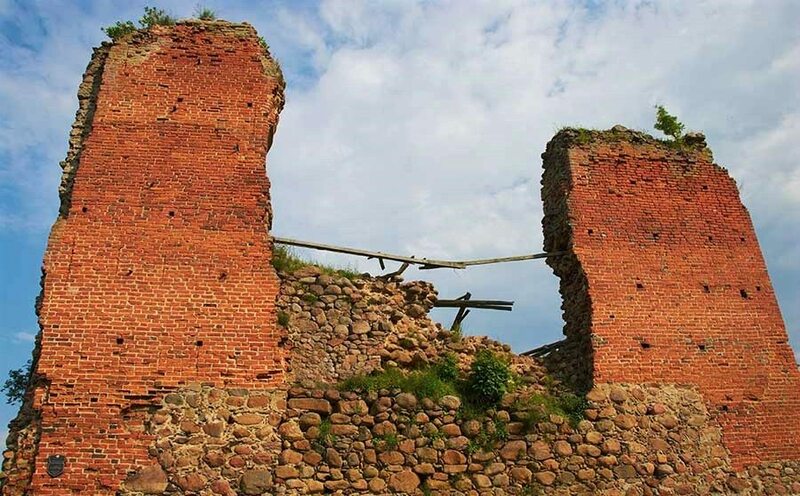 The most ancient stone castles can be seen in Lida, Krevo, Kossovo, Lubcha, Ruzhany, Novogrudok and Grodno. (find out more about each castle or city you are interested in by clicking on the corresponding link). 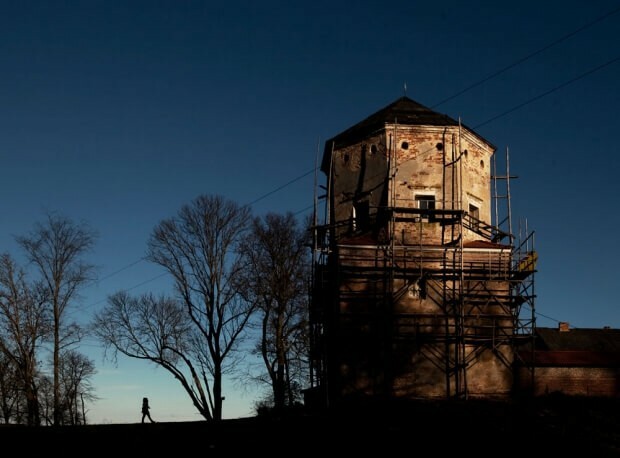 For a long time the Belarusian castle complexes were in decline, and only since recent time, the local authorities have been trying to restore their former greatness. Some castles are also restored for the money from donations or by the efforts of volunteers. For example, Lubcha Castle is being rebuilt by volunteers, without any state assistance. Get to know the castles of Belarus from the video below. The Nesvizh palace and castle complex, erected in the 16th century by the Radziwills, has a long history of wars and destruction. It has been repeatedly burned down and recovered. Only recently, it arose restored in front of the tourists in all its glory. The castle is a UNESCO World Heritage Site. It is worth a visit also because it is only two hours from Minsk. Various festivals and music evenings are actively held in the territory of the Radziwill Castle at different times of the year. You can arrange a picnic in nature, take a dip, ride a bicycle or coach through its parks: Japanese, English, Marysia’s and others. You can stroll through its gardens in winter, or sit on the bench in warm summer evenings, admire the picturesque views of the river and pond with swans, swim on a real boat. In the very castle, there is a hotel where everyone can stop. In Soviet times, there was a health resort here. The sports and recreation center “Zamkovy” was opened after reconstruction in the city of Nesvizh in May 2008. Swimming pool, sauna, hydro massage, billiards, gym, solarium, table tennis – there is entertainment for every taste. In the town of Mir, Grodno region, there is the castle of the same name. You can see it from afar, turning and passing a few kilometers from the M1 “Moscow-Brest” highway. Mir castle was built in this place in the middle of the 16th century, however its owners constantly changed. The ancient walls and avenues store many stories, but are now often used as scenery for filming, which is facilitated by the fact that there is a rare combination of Gothic, Baroque and Renaissance styles in the design of the Mir Castle. There is a museum inside the castle, which will be interesting to visit for antiquity lovers. Also, a hotel for guests has been recently opened. Here, you can spend several nights, feeling yourself the heir of an ancient family (for this you can use the booking form above). But, even if you have come for a short time, several hours are enough to walk along the old park and float on a boat to the island in the middle of a picturesque pond. No less rich is the history of the Kreva Castle. It was the place, where the famous Kreva union was signed. The treaty united the Grand Duchy of Lithuania with Poland. Around this castle, there are many legends about the beautiful girl imprisoned within the castle walls and about the secret tunnel leading to the capital of Lithuania, Vilnius. Also on its territory, there are always various events, mainly connected to folklore. Prince Gedimin built the castle of red brick and stone. Unfortunately, only a few sections of the walls and part of the Princely Tower have been preserved by our time. But, you can come here in summer with a tent and have a great time enjoying the beauty of this place. Another intriguing corner of Belarus is the palace complex in the town of Ruzhany (Belarusians often call it their Versailles), which once belonged to the Sapieha dynasty. Main and eastern buildings, as well as the ‘brama’ and side wings have been preserved to our days. On the territory of the palace complex is the annual “Ruzhanskaya Brama” festival, which gathers thousands of guests not only from Belarus, but also from all over Europe. In the outback of Belarus, on the bank of the Neman river, 150 km away from Minsk, there is the Lubcha Castle, a hidden gem of Belarus. This place is worth a visit to an inquisitive tourist who is interested in the history of Belarus and loves the picturesque landscapes: near the village of Lubcha they are really worthwhile. Here you can fish, swim, and enjoy the sunsets on the banks of the Neman. The castle was built in the second half of the 16th century, has been repeatedly destroyed and changed its owners. In 1964, at a school that occupied the palace building, a local history museum was organized. At the moment, only two towers of the Lubcha castle have been preserved, they are being reconstructed by the volunteers. 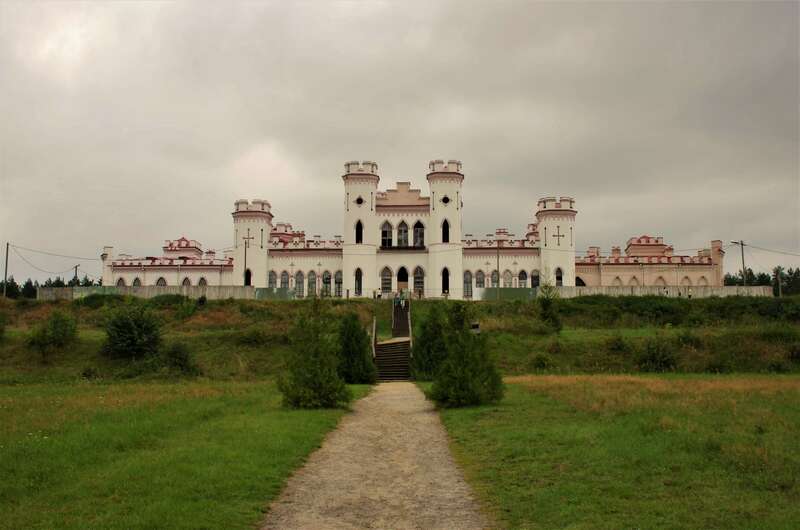 Lida Castle was built in 1323 on behalf of Prince Gedimin and is located in the Grodno region, in the city of Lida. For a long time, it was a part of the defense line against the Crusaders: Novogrudok – Krevo – Medniki – Troki. The castle has the form of an irregular quadrilateral. The largest is the northern wall (93 meters). The southern wall is the smallest one (80 meters). The castle has been repeatedly destroyed, and the last two decades restoration works are undergoing to recreate it. You can also go here in the summer time, when the knight festivals are held. Soon, there will be a museum exposition here. Read more about Lida castle here. Very interesting in architectural terms is the Puslowski Palace (or Kossovo Castle), which was built by the governor Kazimir Puslovsky in 1838, but later his grandson lost the palace playing cards. Initially, the palace had 132 rooms: every year two and a half days the sun completely illuminates each one. Each of the 12 towers of the castle symbolizes the month of the year. Many legends are associated with the Kossovo castle. The most common is the presence of an underground wide tunnel between the palace and the residence of Sapieha in Ruzhany. Since 2008, the castle has been restored. All rooms and gardens will also be restored. Interesting note for tourists: you can visit the house-museum of Tadeusz Kosciuszko, a famous figure of his time, next to the Kossovo castle on the shore of a picturesque lake. There are many other castles in the country. A separate mention is the Old and New Castle in Grodno, the “black” Golshany Castle, as well as the legendary Brest Fortress. The preserved Belarusian castles impress with their monumentality and instantly surround tourists with a mysterious medieval atmosphere. The ancient walls breathe history and legends about the times of princes and knights. If you liked our review of castles in Belarus, save it on your wall or share it with your friends! Have a great trip! Find out the best things to do in Belarus and read about the ancient city of Polotsk.